pipe cleaners and googly eyes. : What a Little Moonlight Can Do. What a Little Moonlight Can Do. Holy Crap. Diwali is freaking awesome. The ringing in my ears from all the loud pops and bangs is going to be with me for a few days. Last night I started washing some laundry by hand. I’ve strung up a little clothes line with the twine I brought. The kids were very happy to see me this morning, as I rode up peddling on the rickety school bicycle with Mukesh on the back; trying to steer and keep balance with someone riding on the ‘backseat’ is a lot harder than all the locals make it out to look. 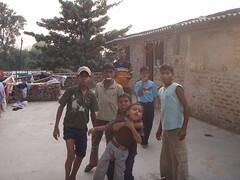 Nikesh suggested last night that I try teaching or helping the boys with their English, today. Not knowing how to teach an English class, I asked them to open their work books for a lesson on reading comprehension; I remembered how much I hated these classes as a kid. To make things worse, I began feeling like the three that did stay, just wanted to hear me read to them a story. The three boys began shouting out the answers to the questions before I was even finished with the question… while I was happy that the boys were answering the questions correctly something seemed off. It quickly became apparent that the reason the others had left was because they had heard and read the same stories over and over again, doing these lessons so many times that they had even memorized the answers to their workbook questions. A crowd started to gather again as tiny arms started to rise with questions and eager answers. After running out of new comprehension questions for them, I decided to interject a vocabulary lesson by asking them if they knew what some of the key words, from the story, meant. I think every English teacher that I have ever had, would have been proud of me at that moment. The three of us laughed hysterically with each silly response. 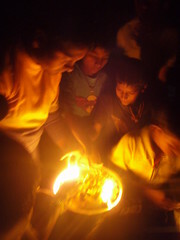 I am remembering what Nikesh had shared with me last night; I have to agree that after just two days with the boys, I’ve learned so much from them and am so very touched by the genuine happiness these kids have in life. I’m very happy that I have been able to spend time with them while the school is on holiday; it’s giving me a chance to see what the Ao Zora School is really about. 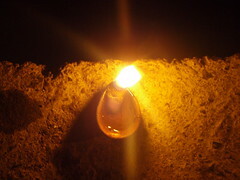 Diwali tonight was much more formal than last night; tiny oil lamps were lit and placed along the edge of the building. 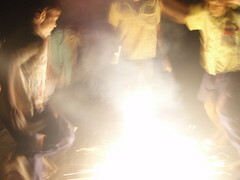 The festivities started off on the roof with lots of fire crackers and sparklers, with everyone having so much fun. It was later moved downstairs to where the Landlords held a small ceremony. 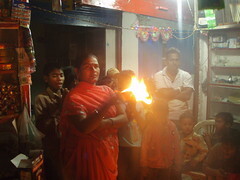 All the kids and adults were singing songs as the Lady Landlord lit more oil lamps. I had read last night, that the sisters are honored on one of the nights of Diwali. The Lady Landlord went around with a saffron powdered dye, marking each brother’s forehead. I was a part of the family. 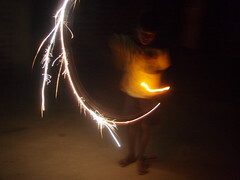 After the ceremonies, the sparklers and fire crackers were busted out again. 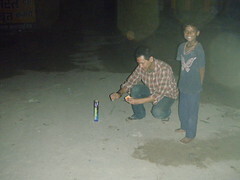 Nikesh and Vinod brought out the humongous finale, which they insisted I light it. It was beautiful… All of it. I don’t know how Nikesh and the rest of the staff do it… especially during the regular school year, 6day schedule.